Administration fee of $45.00 USD per semester is payable at the time of semester enrollment. This fee is a total semester fee of $45, regardless of the number of courses taken per semester. Course Tuition is $375.00 USD per regular course, payable at the time of semester enrollment. New Earth Theological University strives to keep tuition and all administrative fees to the necessary minimum, offering quality new-paradigm learning opportunities leading to advanced degrees. NOTE: No tuition or administrative fee increase in 2018-2019. Most regular courses at NETU require the student to obtain textbooks, purchased by the student wherever they choose. Programs at NETU are offered at a fraction of the very high cost that old-paradigm educational institutions require. We feature quality courses taught by experienced, accomplished professors and instructors at the vanguard of their respective fields, those women and men willing to bridge outdated modes of learning with practical and empowering new pedagogy. Please be advised that NETU does not accept government-funded student aid programs. Master's Program Final Thesis Review fee is $675.00 USD and payable prior to the final thesis submission. The Doctorate Program Dissertation Defense fee is $950.00 USD, payable PRIOR to scheduling the oral exam dissertation defense board convocation. ​Note: On-site graduation services and/or ceremonies may be scheduled by each student's respective conscious community, faith community or organization. Check with your advisor for info on graduation ceremonies or diploma presentations that may be available. NOTE the NETU Refund Policy: Students voluntarily withdrawing from a course within 15 days from the date of enrollment may apply in-writing for a 50% refund of the course tuition. Please be advised that all other administrative fees are non-refundable, and there are no refunds once a course has commenced its first class. 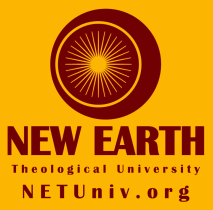 New Earth Theological University has unique academic partnerships with conscious communities and interspiritual ministerial communities, e.g. Alliance of Divine Love International Ministry (ADL). Visit the NETU Payment Center to submit your Academic Partnership Program payments.